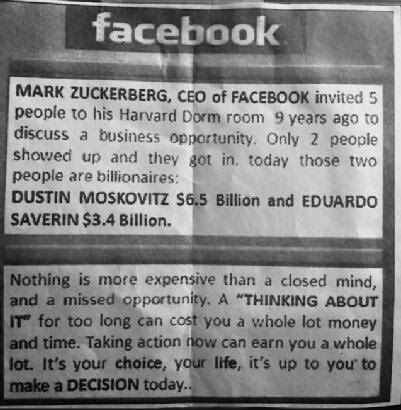 Jason Tratch: Thoughts - Think about your decisions, but not too long! Thoughts - Think about your decisions, but not too long! Don't get caught-up in over-analysis - Yes easier said than done! Depend on your team to address the risks as they arise. But continue to move forward and respect innovative discussions - those are the sources of the game changers. We all sometimes sit on the fence tooooo long before we make a decision. Build the trust, bring your team into the justifications and logic around the decision since they will also need to be there to handle the risks and unknowns - that surely will be present once you start to act on the decisions. Remember, businesses and technologies are changing every day/week/month and the globe is so interconnected that you can be impacted. If you are afraid to act, firm up your risk management and change control process, often failure to act costs more in lost opportunities and integration/procurement costs (others are waiting and being impacted) - so take that into consideration. Buckle up - the world will only get more interconnected. Be timely in your decisions.